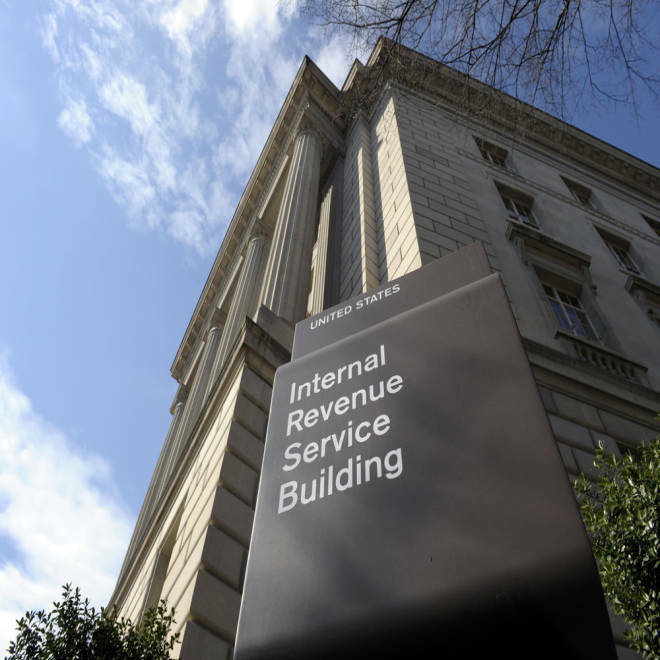 One government worker with a security clearance owed the Internal Revenue Service $2 million, according to the General Accounting Office. Thousands of tax delinquents -- including one who owes $2 million to the IRS -- have sensitive security clearances, posing a risk that has gone undetected by federal agencies, congressional investigators will report Thursday. A report by the General Accounting Office obtained by NBC News found that 8,400 U.S. officials and contractors with access to sensitive government secrets have racked up $85 million in delinquent tax debts. The report, due to be released Thursday morning at a Senate hearing, is the latest example of what members of Congress and investigators say are glaring weaknesses in the government’s system of vetting those receiving security clearances. “It is absurd to give federal employees and contractors who have already failed to follow the law access to our nation’s classified information,” said Oklahoma Sen. Tom Coburn, ranking Republican on the Senate Homeland Security Committee, who requested the GAO study. “Awarding security clearances to tax cheats puts the integrity of the federal work force, along with the confidential materials entrusted with them, at greater risk. Coburn, in a statement to NBC News, demanded that the administration take immediate steps to stop what he called the “egregious” practice of granting security clearances to tax delinquents. A spokesman for Director of National Intelligence James Clapper declined comment, noting that the report had not yet been publicly released. But in written comments to the GAO, a Clapper aide noted that the intelligence office and the Office of Personnel Management were working with Treasury Department officials to develop a plan to check and more closely monitor government databases to identify tax delinquents with security clearances. The GAO study did not examine members of the U.S. military or employees of U.S. intelligence agencies with clearances. Instead, it focused on a universe of 240,000 officials and contractors with clearances elsewhere in the government — such as the Homeland Security, State and Energy departments. It then took the Social Security numbers of those with clearances and plugged them into an Internal Revenue Service database of tax delinquents, yielding matches to about 4,800 individuals — about half of whom had top-secret clearances, the report says. More than three-fourths of the tax delinquents amassed their debts only after receiving their clearances — an indication, congressional investigators said, that those with access to sensitive secrets were not being adequately monitored. The report does not name any of the tax delinquents. But it cited several examples: One of the delinquents with a clearance owed $2 million in back taxes, the report states. Another federal contractor with a top-secret clearance didn’t file federal tax returns for several years and was granted a “conditional clearance” despite concerns among background checkers about his financial problems. But the report notes that the current federal background check system does not check federal tax databases before granting clearances. Instead, it relies on “self-reporting” of debts and checking of credit reports – which do not disclose tax debts unless liens have been filed. The issue of federal background checks has taken on new urgency after revelations that Washington Navy Yard shooter Aaron Alexis was granted a secret clearance for 10 years despite multiple security problems in his background, including a 2002 arrest for shooting the tires of a neighbor’s car. Alexis’ arrest, which he blamed on anger problems and which did not result in criminal charges, was never fully investigated by the private company, USIS, hired to do his background check. USIS, now the subject of a federal grand jury probe, also performed the background check of ex-NSA contractor Edward Snowden, failing to interview any personal references other than his girlfriend. Nor did the firm investigate a reported security violation in his past, according to a report by the Office of Director of National Intelligence. USIS has denied any wrongdoing, saying its background checks in both instances met federal standards and that it is cooperating with the federal investigation.